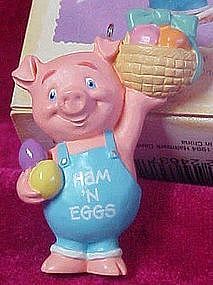 Cute pig in overalls is holding a basket of eggs in this 1995 Hallmark Keepsake Easter or spring ornament. Artist: Robert Chad. Ornament never been displayed, in original bubble wrapping. Box condition is average with a bend at the top.